Pakka Jacks is a wholly owned subsidiary of TFP Engineering, one of Australia’s leading providers of maintenance services for the mining industry. The Pakka Jacks system was conceived and developed to create a competitive advantage for this maintenance work, and has been so extraordinarily successful that it has evolved into a commercial enterprise in its own right. Every feature that has been incorporated into this system was a response to actual site conditions, with constant focus on making this system safer, faster and easier to use. Research and development over the past decade has been relentless, resulting in a system that is reliable, safe, and freakishly effective. We know this game inside out. In fact, we’ve just changed the game. To get in this game yourself, give us a call. The Pakka Jacks system was imagined in the dust and heat of Australia’s mine sites. It was here that it was developed and refined to become a world-class, game-changing product. 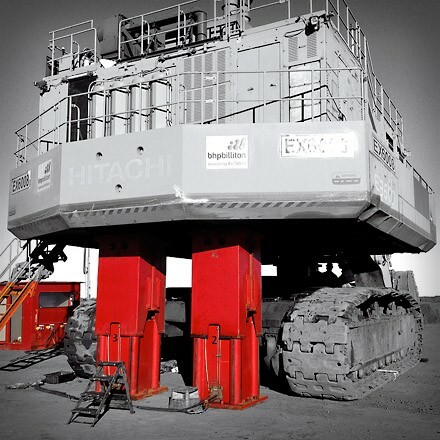 The Pakka Jacks system has given TFP Engineering an incredible market advantage in mining machine maintenance. Every technical improvement to the system has made our maintenance work safer, faster and/or easier. Every new project has added to our knowledge base, and confirmed that this system is an enormous step forward in every respect. TFP has been in operation since 2001, providing maintenance services to various industries, with a major focus on open cut mining. In 2004, TFP started to specialize in major shutdowns on Shovels and Draglines. The Pakka Jacks system was part of a revolutionary suite of machines and procedures that were created to make this work more efficient and safe. In 2007 Pakka Jacks was established as a separate enterprise and TFP started preparing the system for the international market. TFP Engineering continues to bring the Pakka Jacks advantage to mine sites around Australia. Our client list includes most of the major mining companies in Australia, and continues to grow rapidly. When safety or turnaround is improved by even a small margin, it’s an important step forward. When safety, turnaround and cost-effectiveness are improved by such huge margins, it’s a new game entirely. Pakka Jacks started operation in 2007, after three years of development by TFP Engineering. The results of this new approach were astounding. Downtime and maintenance costs were slashed and site safety was raised to new levels. Our client list started to grow very quickly. Bringing this system to the world market changes the game on a much bigger scale. It is impossible to ignore the advantages of this system - nothing comes close in terms of safety, time savings and cost effectiveness. Our client list includes most of the major mining companies in Australia, and that list is growing quickly. For safety alone, the Pakka Jacks system is incredibly compelling. It satisfies all current standards and regulations. Add to this, the cost and time benefits and it should be no surprise that these mine operators refuse to go back to the old methods. We have successfully completed work for most of the major mining companies, including BHP Billiton, Rio Tinto, Newcrest, Xstrata, Sojitz Minerva Mining, Theiss Australia Mininga and Coal & Allied. No mine operator who has used this system has ever gone back to the old approaches. The Pakka Jacks system is a market advantage for anyone that utilizes it. It has immediate impact on site safety, machine availability and running costs. Talk to us about bringing this market advantage to your operations. We have enormous experience and engineering expertise and we are trusted by some of the biggest companies in the world. The game has changed. It’s your move. Talk to us.